Did you know 85% of pets suffer from periodontal disease? 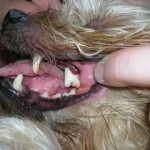 Your dog or cat’s teeth should be clean and white, with healthy pink gums and pleasant breath. Take a look in your pet’s mouth --- if their teeth are discolored with plaque (a sticky yellow or brown staining) and swollen, red or bleeding gums and a foul odor, you’ve got a problem. Dental disease not only causes bad breath, an unpleasant appearance and possible eating problems, it can also contribute to even more severe health issues. The bacteria that produce plaque releases enzymes and toxins that can damage the underlying bone structure, leading to severe pain and eventual loss of one or more teeth. In addition, those same bacteria can enter the bloodstream and cause damage to organs such as the heart, kidneys and liver. How can you prevent this from happening to your pet? First, it’s important to have a thorough veterinary examination – we can identify gingivitis and broken teeth and schedule an appointment for any necessary procedures. While under anesthesia, your pet will receive a further detailed evaluation and a professional cleaning, which includes ultrasonic scaling to remove plaque and tartar, as well as polishing, fluoride application, and an oral sealant to help prevent plaque buildup. If necessary, X-rays of the teeth will be taken to identify any damage that may be occurring under the gums, and any abnormalities can be addressed before larger problems develop. Many times all that is necessary to eliminate bad breath and gingivitis is a thorough cleaning. (See Photo 2). But it’s important that you follow up with regular at home dental care to keep your pet’s mouth in good condition. Our experienced and expertly trained staff can instruct you on the proper technique and products to use. Your dedication to keeping your pet’s teeth clean will help ensure a healthier and longer life! 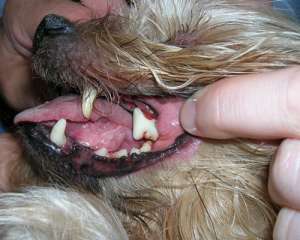 For additional information on dental disease and some of the recommended products, please visithttp://www.virbacvet.com/.